Verdun is “the first multiplayer FPS set in a realistic First World War Setting.” It features bolt-action rifles, trench warfare, gas attacks, and more. 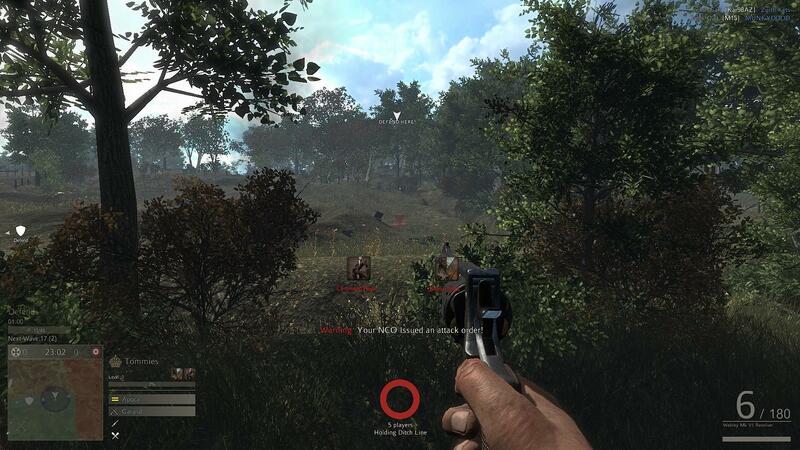 The game focuses on four-person squad gameplay, with matches of up to 32 people. 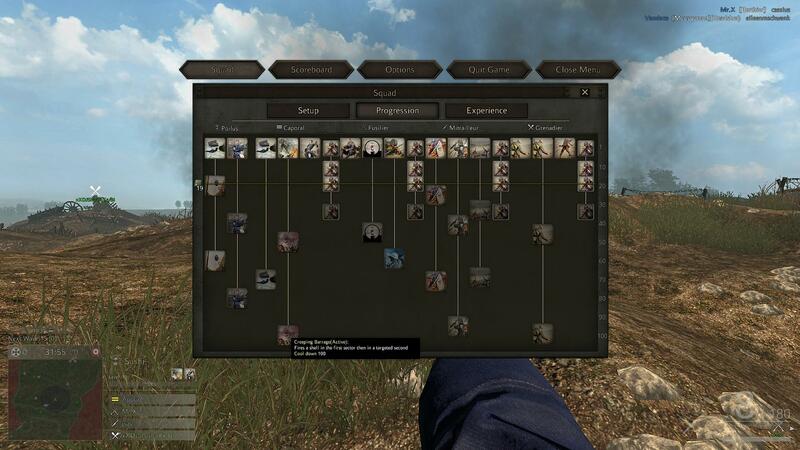 If you’re a fan of historical FPS games like Red Orchestra 2 or Heroes & Generals, this may be a game to check out as it offers an accurate representation of warfare during the First World War. Now that Verdun is out of Early Access, it’s time to give it a review and see how it holds up to critique. 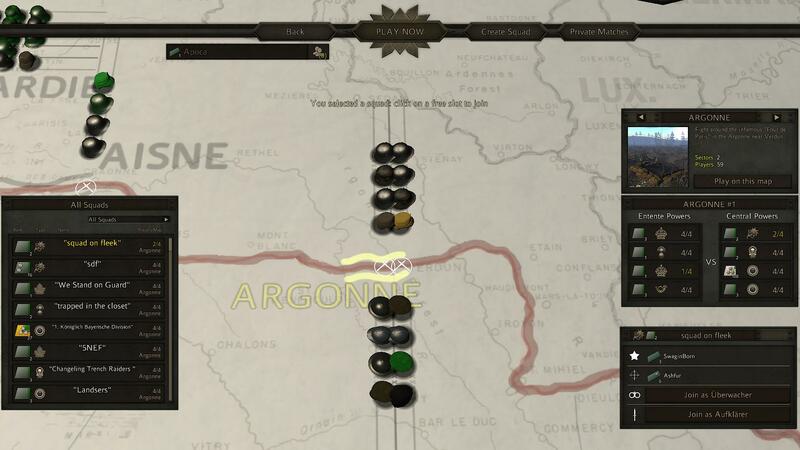 Verdun does offer some customization options, mostly in choosing from a limited number of loadouts per faction/role. 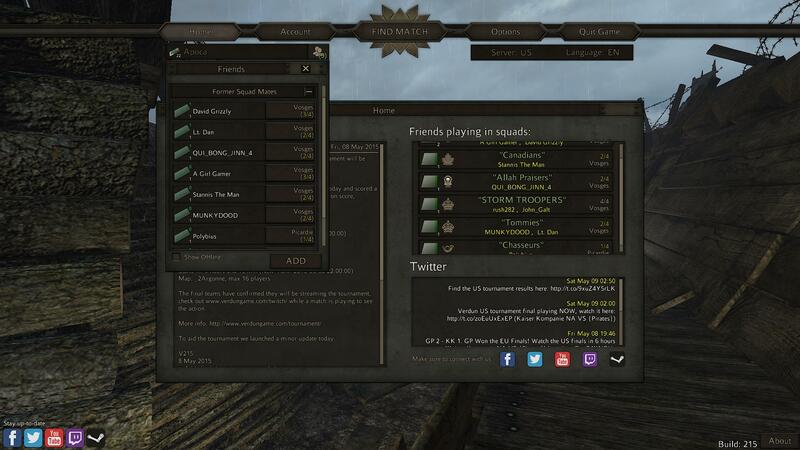 You can name your squad (if you’re the squad creator) and set which faction or “Power” the squad is part of. Other than that, for now, you won’t find much in the way of customization. Which, for me, is perfectly alright. I don’t play these types of games so I can create a unique looking character with a gun with twenty customizable parts. I play for the awesome historical FPS action that a vast majority of games don’t even come close to. 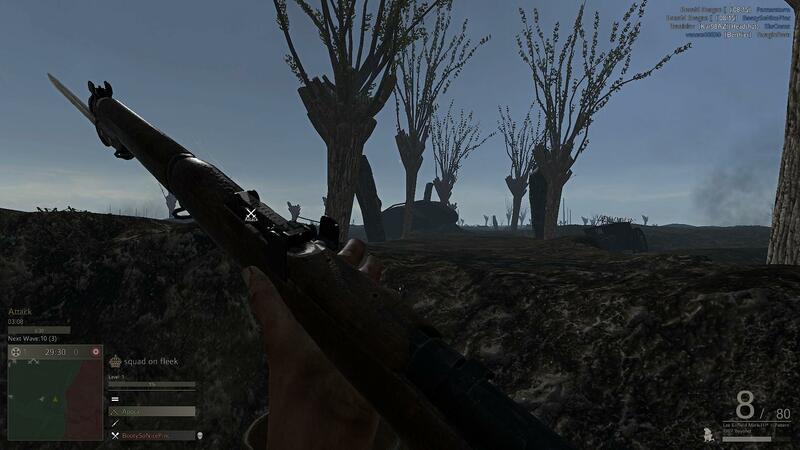 Verdun looks fantastic. If you’re a fan of good visuals and awesome explosions, you’ll be right at home here. Honestly, my favorite part of the game is how great the artillery and mortar shots look and sound. The effect of being caught in the middle of a mortar barrage really gets your heart pounding, which is something I find doesn’t happen in games as much as it should. The weaponry models look perfect, too, especially with the “iron sight” aiming mode. Overall, I was completely satisfied with the graphics in Verdun. This is the one place where I did have some frustration. 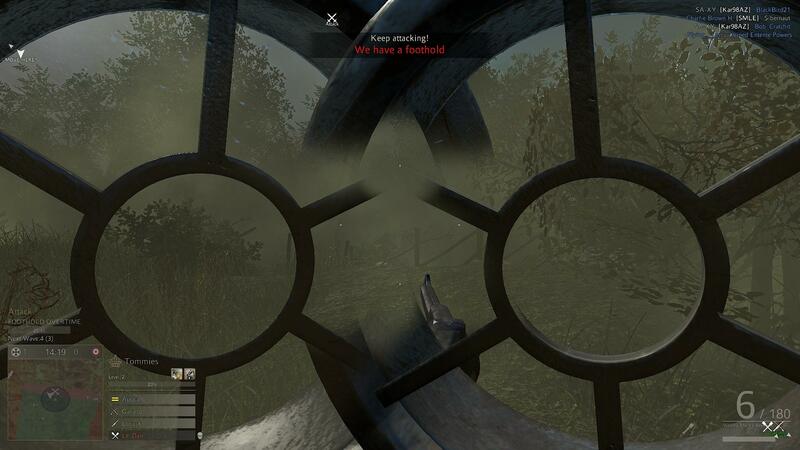 For the most part the controls in Verdun were alright, however at least a few times a match I would run into an issue with the controls that would cause me to die. If this were any lesser of a game, I would have given up on it because of that issue. Usually, the only time I would run into a problem is while trying to switch between crouch, prone and standing. 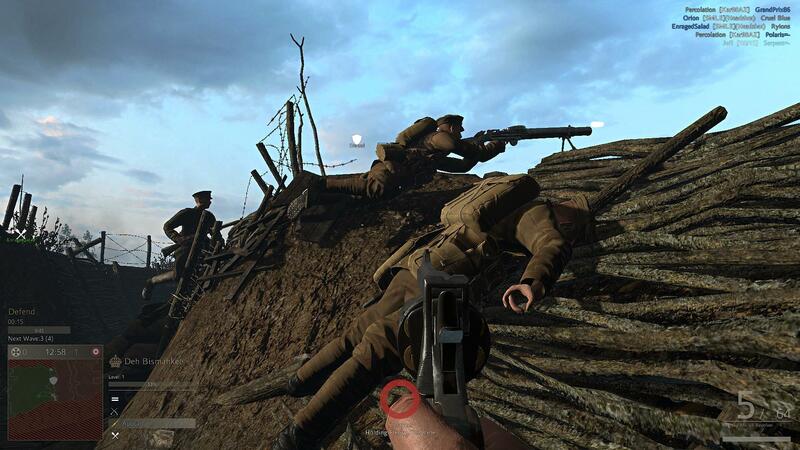 Like with most shooters, the community within Verdun is a mixed bag. You’ve got the awesome players who are helpful or are at least good sports. Then you’ve got the racist-cause-it’s-funny thirteen year olds. You’ll be introduced to this quite quickly when browsing through squads to play. Most of the community, however, seems to fall under the “helpful” category or at least decided not to participate in communicating at all. The forum community also seems to be decent for Verdun, as well. 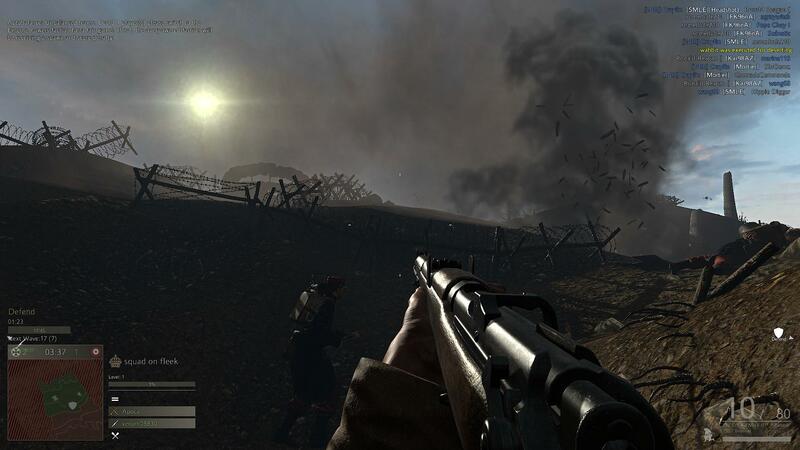 As a longtime fan of Red Orchestra 2 (made by a different company), I was instantly interested in Verdun as it appeared to be the World War I equivalent of my all-time favorite FPS. I’ve always preferred the slower, more strategic gameplay of historical shooters to the fast-paced, nothing-but-twitch stuff we get with Call of Duty and Battlefield. So I have to admit I was excited right out of the gate. And, so far, Verdun seems to have delivered. Of course, as with all games, there are some things that disappointed me or need some polish. But I’ll be getting into that shortly. One of my favorite things about Verdun is their loyalty to replicating the weaponry of the time. Each weapon you come across will be beautifully detailed, whether you’re sprinting with a rifle in your hands or aiming down the sights of a revolver. 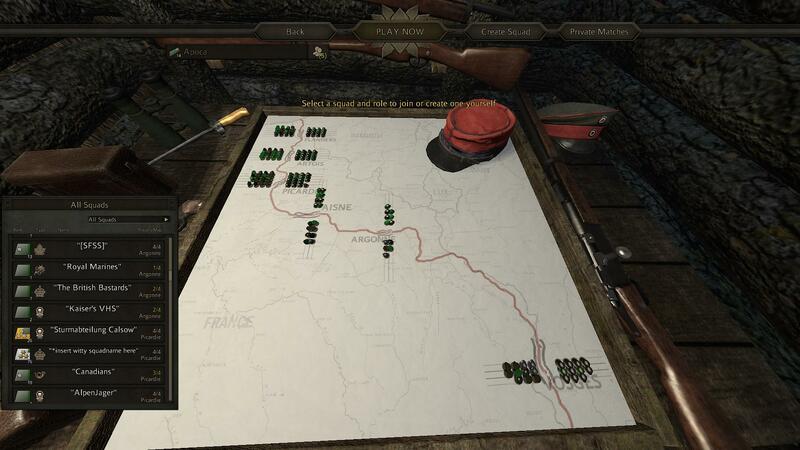 Red Orchestra 2 instilled in me a respect for bolt-action rifles, and Verdun has definitely helped the case. Between the two games, you get a nice idea of how much (or little) weapon tech had evolved between the two world wars. Verdun has also lead me into researching more about the war, educating me on much I would have otherwise been in the dark about. You know a game has done something right when it inspires you to spend a few hours on wikipedia as well as other obscure history websites. One of the interesting aspects of the game is the use of various gases. I’ve read about the use of gas attacks during World War I before, but actually being able to experience one – how quickly you can go from breathing clean air in a trench to finding your senses failing you with death creeping in as you desperately put on your gas mask and hope you did it fast enough. And I’ve got to say the gas mask mechanic is one I enjoyed a lot. Not sure why, I also enjoyed the gas mask mechanics in Metro Last Light. And that brings me to Verdun’s emphasis on squad play. You can either hop into a pre-existing squad or set up your own squad to play with friends, each of you taking an important role. Gas, mortars, and recon planes come into play via the NCO abilities. The NCO (Non-Commissioned Officer) is the “Squad leader” and can give attack and defend orders to their squad, as well as make use of various abilities depending on the current “Power” the squad is representing. The level that the NCO has in that particular Power also carries some weight in the potency. Because of the leveling system and how players can level up their own “career” as well as individual Powers (or Factions), sticking to one type of unit or one particular Power is encouraged. The game makes it very easy to join into matches with those you’ve been squadmates with before. Even without having them as Steam friends, there are three or four players that I try to play with whenever I can as we seem to have good synergy together, and we usually end up taking the same roles while playing the same Power. To me, that’s fantastic. Not many other games encourage random players to play together repeatedly like that. 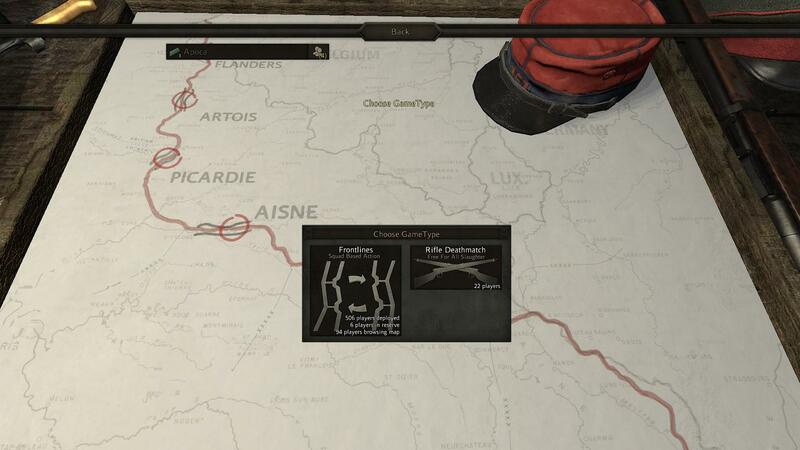 The flow of combat in Verdun is very defined. There are defend phases, attack phases, and counter attack phases. Each defines how a side will play – if your side is currently in an attack phase, that’s what you’ll do. During the attack phase, your side has nothing to defend. This goes to the point that if someone in the side with a defense phase tries to leave their trench and advance towards the enemy, they will be automatically killed after a few seconds has passed without them returning. 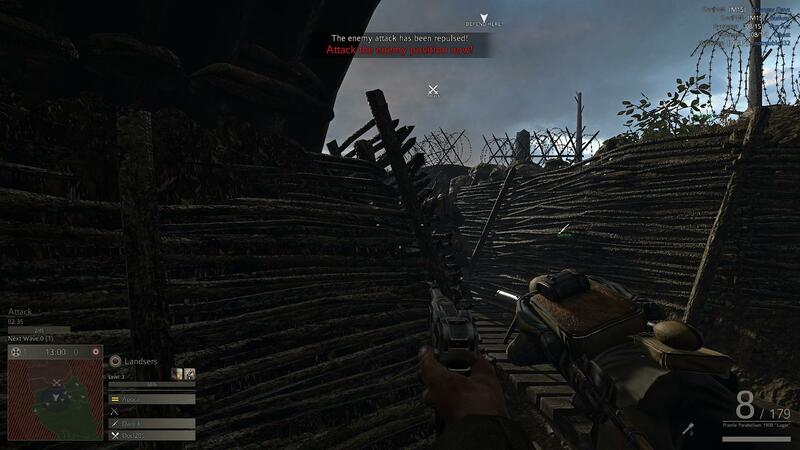 Each phase also has what could almost be considered “mini-phases.” For example, if you get into an enemy trench during an attack phase, you will initiate a “Foothold” giving your team some extra time to continue the attack. If more players make it, you will gain “Momentum.” If you have enough people in the point as the attack phase timer runs out, you will go into an overtime of sorts. If you’re pushed out, however, your attack phase will end and you will enter a defense phase. Because of this, battles can go back and forth; you can gain land and then lose it and the nature of trench warfare during World War I really comes to light in ways that you just can’t get from a movie or book. Matches are a maximum of 32 players. Though, in my experience, it’s rare for a match to maintain 32 – or even more than 22-25 – players. This is because of the way the matchmaking works, a lack of penalty for leaving a match, and teams aren’t forced to be balanced. The major issue I’ve ran into, though, is imbalanced teams. Because of the emphasis on squad play, the game can’t really forcibly split a squad to balance the teams. That would just make people upset and potentially quit playing. And because they don’t want to force squads to split and break up friends, they can’t really hold it against you for leaving a match that isn’t balanced (you won’t get any experience you gained through the match if you leave early, though). In the end, you get a situation where a balanced game of thirty-two players is a rarity. On the game map, each icon represents a match. I actually like this method of finding matches, as it’s more interesting than the traditional game list or sit-and-wait matchmaking. You can see how a match is currently going – how many plays on each side and what their levels are. As a newbie you probably won’t make use of this information as you should, but after about ten hours of play you begin to notice what types of games have a good chance of being balanced and retaining players. This alleviates some of the annoyance with the issues I mentioned above. There are two types of matches: the traditional team versus team matches that I discussed earlier (with the “flow of the match”), which make up a bulk of the game vs the Rifle Free For All matches, which seem to rarely have more than twenty players participating which doesn’t make them so appealing. When you can manage to get a decent match in Rifle Free For All, it’s a really helpful experience as it allows you to refine your rifle skills faster than would be possible in a normal match. It’ll also teach you the importance of cover and constant movement, which is a hard lesson to learn otherwise. I’ve always had an interest in warfare between the 19th and 20th centuries, so I’m constantly looking for games that can fill that criteria. Verdun fits this and is a perfect companion to Red Orchestra 2. Perhaps once Verdun gets some polish around the edges and travels further down their development roadmap, it’ll be able to take the place of my all-time favorite FPS. For now, though, it’s a close second and definitely worth the purchase. If you’re into historical warfare and want a fairly accurate representation of how World War I was fought, definitely check out Verdun on Steam! Features: 4/5 – Lots of goodies. 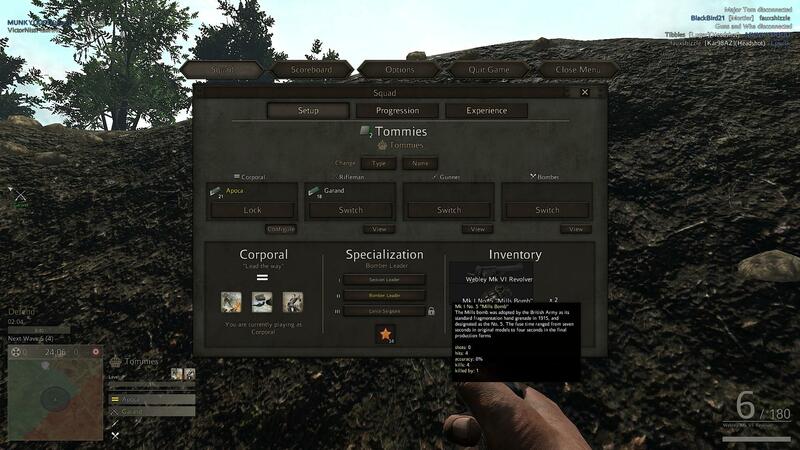 Customization: 3/5 – Some customization, but not much. Graphics: 4/5 – Games look fantastic and runs on Ultra settings quite well. Controls: 2/5 – I felt like I died because of the controls way too often. Community: 3/5 – A mixed bag, like most games. Overall: 4/5 – Impressively close to perfection.